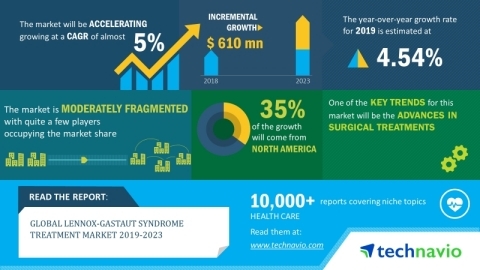 The global Lennox-Gastaut syndrome (LGS) treatment market is expected to post a CAGR of close to 5% during the period 2019-2023, according to the latest market research report by Technavio. LGS is a rare, refractory, debilitating type of epilepsy with life-threatening consequences in pediatric patients. The treatment for LGS rely on the seizure type and requires a broad spectrum of anti-epileptic drugs. The identification of LGS in the early stages helps in treating it more effectively. As a result, many government and non-government organizations are taking initiatives to increase the awareness of the early diagnosis and treatment of LGS across the world. For instance, the National Organization for Rare Disorders (NORD) and Genetic and Rare Diseases (GARD) Information Center are raising awareness about the signs and symptoms, causes, diagnosis, and standard treatment of LGS in the US. Hence, the increase in the number of organizations that create awareness about LGS will propel the growth of the LGS treatment market during the forecast period. As per Technavio, advances in surgical treatments will have a positive impact on the market and contribute to its growth significantly over the forecast period. This global Lennox-Gastaut syndrome treatment market 2019-2023research report also analyzes other important trends and market drivers that will affect market growth over 2019-2023. Corpus callosotomy is a palliative surgical procedure which has been commonly used to treat patients with generalized seizures including drop attacks due to LGS. However, callosotomy involves craniotomy with microdissection. Hence, to overcome the downsides of corpus callosotomy, many companies are introducing novel minimally invasive methods for performing the surgical ablation of epileptogenic foci. For instance, MR-guided laser interstitial thermal therapy (MRg-LITT) was introduced recently, which can be used as a minimally invasive method for performing the surgical ablation of epileptogenic foci and corpus callosotomy. Such advances in surgical treatments will fuel the growth of the global LGS treatment market during the forecast period. “The number of patients with medical conditions such as trauma, stroke, perinatal hypoxia, tuberous sclerosis, and cortical dysplasia is increasing significantly. Congenital infections and infections to the central nervous system, such as encephalitis and meningitis, are also increasing which are major risk factors for LGS. This rise in the number of patients with these risk factors is increasing the prevalence of LGS, thereby driving the growth of the LGS treatment market” says a senior research analyst at Technavio. This market research report segments the global Lennox-Gastaut syndrome treatment market by type (surgical treatment and non-surgical treatment) and geography (North America, Europe, Asia, and ROW). The non-surgical treatment segment held the largest Lennox-Gastaut syndrome treatment market share in 2018. The growth of the non-surgical treatment segment can be attributed to the recent drug approvals for the treatment of LGS and the adoption of a ketogenic diet. The North America region led the market in 2018, followed by Europe, Asia, and ROW respectively. North America dominated the global LGS treatment market owing to the rising awareness of LGS and the increase in funding for the research on LGS in this region. Also, the strategic alliances among organizations that promote awareness about LGS are also supporting the growth of the market in the region. More From BioPortfolio on "Global Lennox-Gastaut Syndrome Treatment Market 2019-2023 | Advances in Surgical Treatments to Boost Growth | Technavio"